For the last few months I’ve been using OmmWriter, a program that turns your computer screen into a blank page. I became weary of the buttons and what not in Word that were so distracting and wanted to remove as much as possible. OmmWriter has done all of that for me. And if you want to try it for yourself, here’s a few things you should know. 1. It’s great for blocking out the crap on your computer. OmmWriter fills your screen with a blank white page. But it does provide other options for monochromatic and minimalist backgrounds. I use it primarily for my morning pages routine. It’s meant to be a meditative writing exercise and has helped me immensely to focus on the words and clear my mind as I write. 2. Speaking of crap…OmmWriter doesn’t have those obnoxious red and green squiggly lines that Word uses to tell you they think you’ve made an error. There are small, simple buttons that allow you to format text and a text box that can be adjusted in size. But these disappear once you stop moving the mouse and start writing. 3. Having said that…The onus is on you to format it once you do have it in a program such as Word. OmmWriter does not have any tool for spelling & grammar check, paragraph indentation, or formatting text. This adds an extra and sometimes frustrating step to the process. So before you start writing the great American novel on this program, consider what you want to get out of it. You don’t want to write 30 pages only to go back and format and edit the entire thing. 4. What if I like listening to music? OmmWriter has a few options for listening to massage-parlor-ambient music. This can either be very relaxing. Or it can feel like fingernails on your brain to the background noise of a dying animal. Like I said, it really depends on what you need. If you’re like me and you work to a particular type of music, you can have other programs running (iTunes, Pandora, or Songza) and listen to music while you work on OmmWriter. 5. And how on earth do I save a document? The best way that I’ve found is to copy and paste the text into Word or what program you fancy. Another step in the process to be mindful of. You can save it as an OmmWriter or Text Edit document. So far as I can tell there are no print options in the program. 6. So what is this program good for? Distraction free writing, and let’s face it, this is something every writer needs from time to time. If you long for the freedom of writing on a blank white page without the writer’s cramp, then OmmWriter is a great program. You have to decide whether it’s worth the hassle of formatting and copying text to another program. Disclaimer: It’s not completely distraction free. There is a very easy way to close the OmmWriter screen and look up something harmless on the Internet…and 30 minutes later you’re looking at pictures of Game of Thrones actors without their facial hair. Finally, there are two versions of OmmWriter. They offer the same features in the way of backgrounds, text, and sound effects. I’ve been using the first, unpaid version and have been quite content with it. If you try the first version and fall in love with the program, then you can opt to pay for the second version. It has more background and music options. According to the folks at OmmWriter, they’ve performed extensive research, particularly with a color therapy expert to enhance the tranquil experience and promote creativity and enrich the experience. I have no idea what this means, but I hope they make a TED talk about it. For more enlightenment, read their Frequently Meditated Questions. Users of OmmWriter, I would love to hear your thoughts and opinions. What do you think of OmmWriter? Has it improved your writing experience? More importantly, have you found a better method to convert to Microsoft Word? This is a great way to write. Lord knows we have enough distractions out there, pulling us from what want to accomplish, so everything we can do to minimize them is big plus. I get my distraction free writing from a piece of writing software called Scrivener. If you haven’t tried it yet, I’d suggest giving it a whirl. It allows you to do you writing distraction free but still remain within your normal writing environment. Note that you’re not writing in Word but your work can be exported in Word format. I absolutely love this software. Very true, it’s hard to eliminate distractions. 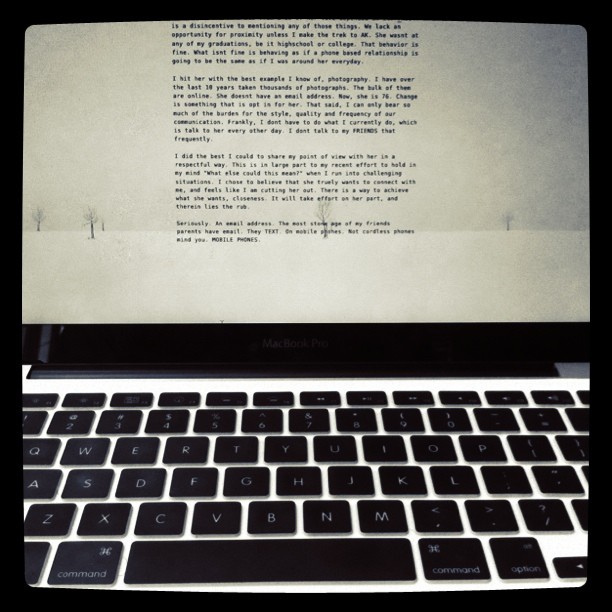 I now write all my first drafts on OmmWriter so I can focus on just getting it done. And I’ve heard nothing but great things about Scrivener, and I’d love to try it. Thanks for reading!